Philadelphia — Urban Engineers announced that Owen Hitchcock, a graduate student at the Pennsylvania State University, is the winner of the firm’s inaugural Excellence Student Article Competition. As the winner, Hitchcock will receive a $500 scholarship and be published in the print and digital editions of Urban’s Excellence magazine, which is produced in-house. Originally from Raleigh, N.C., Hitchcock is a second-year graduate student pursuing his Master of Science in civil engineering. His article reimagines the waterfront along the Susquehanna River in Harrisburg, Pa. According to Harrisburg City Engineer Wayne Martin, the concrete steps and walls on the riverbank were constructed between 1914 and 1917 as part of the City Beautiful movement. The walk and steps provide public access to the river, armor the riverbanks against erosion, and protect a sewer line that runs under the slab and behind the steps. Hitchcock’s vision echoes what many in Harrisburg would like to see, and is reminiscent of “Riverfront Destination,” one of the highest-ranking concepts from the public engagement process for the city’s Comprehensive Plan. Read his article on Urban’s Excellence blog at https://urbanengineers.com/blog/student-article. 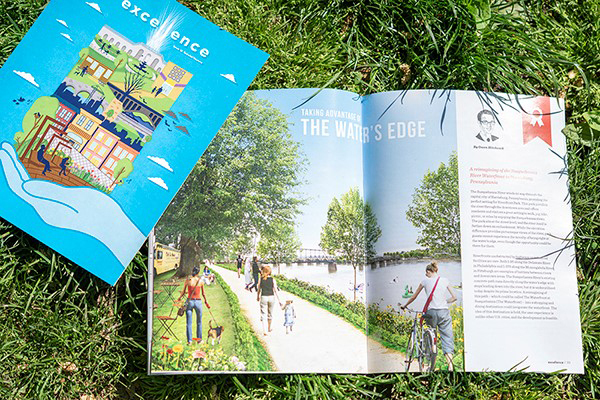 Urban created the Excellence Student Article Competition to create a scholarship opportunity for talented college students studying an academic discipline related to the built environment — including, but not limited to, engineering, architecture, design, construction, real estate, and environmental studies. Students were invited to create a pitch for an article relating to the theme of rebuild/restore for a chance to win a $500 scholarship and have their article published in the 12th volume of Excellence. Students who are enrolled at the time of entry in any related academic program offered at a school that has received an Official Contest Invitation were eligible to enter. Those entering submitted a 250-word pitch for their article, as well as a mood board and/or ideas for supporting graphics.